Library Loot is a weekly event co-hosted by Claire from The Captive Reader and Marg from The Adventures of an Intrepid Reader that encourages bloggers to share the books they’ve checked out from the library. We got to the library only to find the parking lot pretty darn full! The kids’ section was packed with plenty of school-age kids which kind of made it difficult for wee reader to do his usual roaming but still he had fun. And I got to pick up some loot – a little less this week as I’ve got a full load of e-books going on too. Tony Chu is a detective with a secret. A weird secret. Tony Chu is Cibopathic, which means he gets psychic impressions from whatever he eats. It also means he’s a hell of a detective, as long as he doesn’t mind nibbling on the corpse of a murder victim to figure out whodunit, and why. He’s been brought on by the Special Crimes Division of the FDA, the most powerful law enforcement agency on the planet, to investigate their strangest, sickest, and most bizarre cases. Hmmm apparently I had requested this from another library a while previously, and the hold came in. Completely forgot! Now I have two de Moor books (well one is an e-book). Young, flame-haired Lucie raises horses on her father’s farm. One summer day, she meets a dark, handsome stranger, Joseph, and it is love at first sight. But their union is as improbable as their love is deep. For Joseph is a wanderer, a full-blooded gypsy, a man for whom all Europe is a stomping ground. Despite their cultural differences, they marry – have three children, and lead a normal life – with one exception: each spring, their life is suspended as Joseph returns to his other family, the gypsies, scattered to the four corners of Europe. What did you get at the library this week? The premise of Chew freaks me out a little – a cannalbalistic psychic is a tad too gruesome for my tastes! 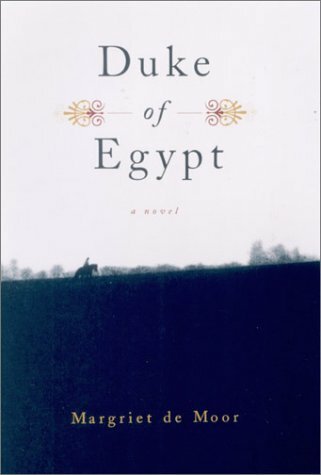 But I do hope you enjoy it and that the cover for Duke of Egypt is lovely. Yes Chew is quite something!